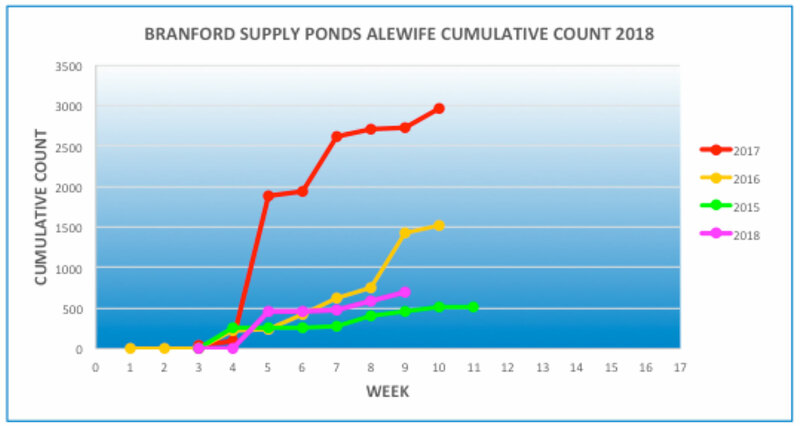 The alewives continue to trickle into the Supply Ponds — 108 in the past week, bringing the year-to-date total to 694. This year is shaping up to be a virtual repeat of 2015. 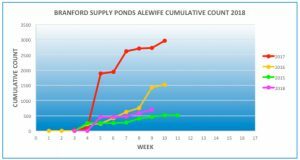 According to the DEEP, the alewife runs seem to be over in many of Connecticut’s eastern-to-mid coastal streams. Some of you may be wondering about trees that came down into streams and rivers during last week’s storms. Removing trees from streams is no one’s responsibility– not the DEEP, not the the Towns, nor anyone else. The DEEP does not recommend removing trees from streams unless they pose some special risk such as blocking a culvert. In fact, large woody debris is good for streams, both for stream channel formation and fish habitat. The weather is beautiful right now. It’s time to get outside and enjoy the woods, streams, meadows and salt marshes.